Bhajji Ambado is a delicious rice based fritter. In Konkani, bhajji means amaranth leaves. I got this recipe from my mother. My mother uses a different leaf called 'Taikilo', which grows abundantly in the monsoon season. I am a big fan of those fritters. Since I don't have access to taikilo (an edible weed), I just used amaranth leaves. Guess what? To my surprise, it tasted similar to those fritters and I was on top of the world:-) I didn't even think that it would taste that good. 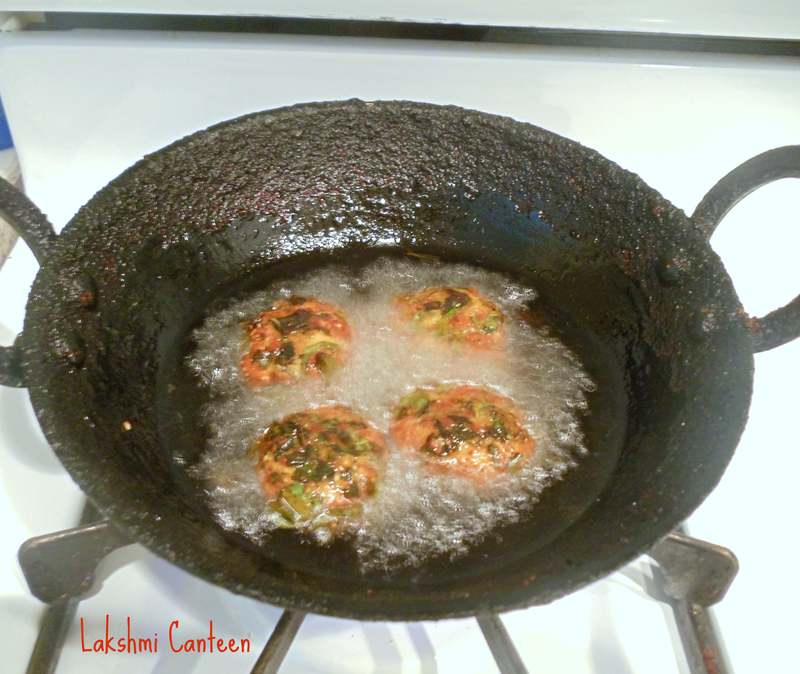 Do try making these fritters and enjoy!! Wash and soak rice in water, for 2 hours. While it is soaking, wash the amaranth leaves and pat dry using a towel. Then give it a rough chop. Once the rice gets well soaked, drain the water completely. Now grind together the soaked rice, red chilli, grated coconut, tamarind and salt to get a coarse sticky paste (don't add water while grinding). Once it is done, drain them on a paper towel to remove excess oil. Bhajji Ambado is ready!! Serve it hot with rice and dalitoy. Above measurement makes 12- 14 fritters.